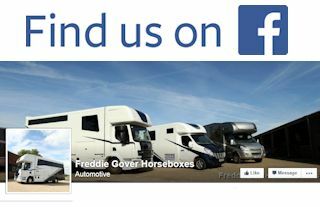 Manufacturers of horseboxes that offer the ideal in style, comfort and safety for you and your horse in a variety of designs to suit all budgets. Based on the Surrey/Sussex border just 5 minutes from Gatwick Airport. We are specialists in building high quality lightweight horseboxes, known specifically for our Superlight build. 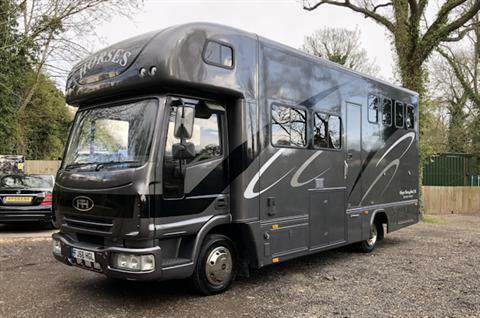 This 7.5 ton horsebox is currently one of the only available to carry 3 horses as well as a full living and underfloor storage. 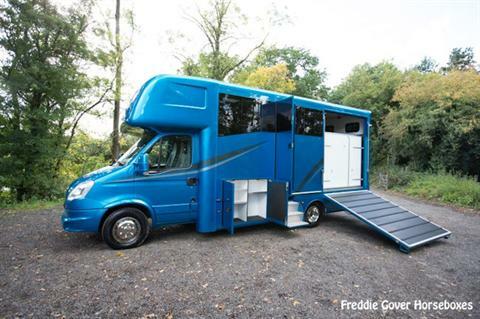 This beautiful 2014 14reg 2/3 Stall Equicruiser has had just one local private owner from new and has only ever carried ponies. Easy lift ramp lined with kraiburg rubber, 2 Lightweight Stainless Steel Frame Partitions, 10mm Rubber Lined Front & Rear kick Panel, Floor Drainage, Lightweight Aluminium Rug Rack, Glass Skylight, 2 Extractor Fans. In excellent condition. Available in 2 weeks it will be fully valeted, machine polished before sale and inspected before sale. For sale on behalf of customer who is upsizing. 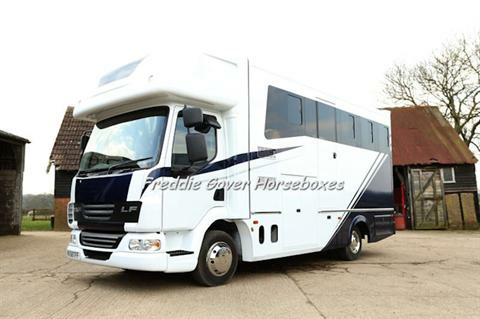 Rarely available 2008 58 reg compact 7.5 ton 3 horse with overnight living. 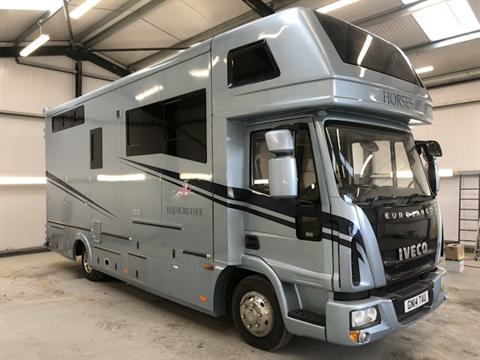 Bonded windows, rear LED lights, rear skirt locker, 140 litre water tank with horse wash.
2006 56reg Iveco 75E17 Thorpe Thoroughbred 3 horse lorry with full living. Well maintained and drives very well only covered 113,000 miles- tested until March 2020. Full tilting cab. 1.75 ton payload. Horse area and reversing camera. Very smart full living with Hob/Grill/Oven, 60 Ltr Fridge, Upholstered leather Seating, Overhead storage, Hot and Cold Water, Sleeping Over Cab, Sleeps 4, 240v hook up, Horse Shower, Central Heating, Auxillary Battery system. Living area sleeps 4 people comfortably. Bathroom with toilet, fold down sink and vanity mirror. Currently there is no shower tray fitted but this can be retrofitted easily. Large external saddle locker into the living area. Various additional skirt lockers, large water tank. 9 foot horse area stalled for 3 horses. Padded partitions, aluminium floor, easy lift ramp. Overall in excellent condition just been fully machined polished and valeted. Sold on behalf of upgrading customer. Will come with 12 months test. Beautiful living area sleeps 3 people comfortably with plenty of cupboard space. It has blown air central heating, leisure battery with solar charging, sink, hob and fridge. Leather upholstery matching cab seats. Large outside tack locker for 3 saddles with swing out saddle rack. Skirt locker with horse wash supplied from a large built in water tank. Nearside tack locker with shelves for extra storage. The horse area is stalled for 2 large horses facing forwards. In front of the horses there are two large opening windows with stainless steel grills. The aluminum breast bar is collapsible in case of an emergency. No tack lockers in the horse area. The easy lift ramp is lined with a one piece moulded rubber mat and has a low loading angle to encourage easy loading. 5 foot loading doors. To aid ventilation and keep the horses cool there are further horse area vent windows and a large roof vent. Swan neck stainless steel sliding partition. Outside tie up protection mats. Very clean Iveco chassis with 110,000 miles and full service. Will come with 12 months test. Can only be described as immaculate condition only for sale due to customer due to us having a smaller lorry in build.